When I used to work in Farringdon, we would occasional go for a drink in what we called 'the secret pub' which was a 400 plus year old pub in a little back alley that only the observant or adventurous ever discovered. I was interested to hear a few years ago of a 'secret church' that had started a few years before (October 2009) in Worcester Park. They had been meeting regularly at Green Lane Primary School and the congregation had since tripled in size. It so happens that Grace Church, Worcester Park wants to further reach out into the community and invite anyone who'd like to come along to do so over the next few Christmas themed events. "Christmas is a strange time - being happy is compulsory, but often the stresses and strains of normal life weigh on us most heavily over the festive period. 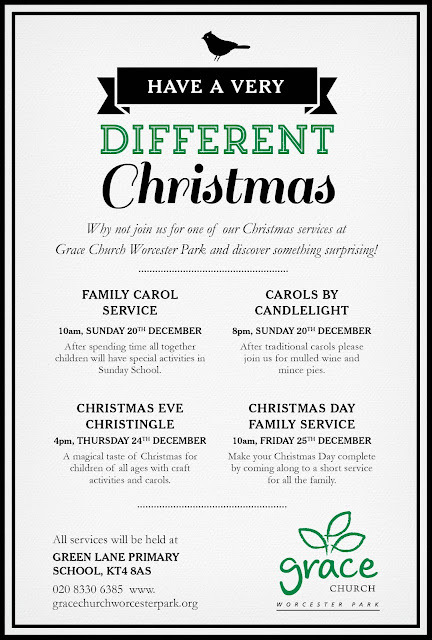 And that's why Grace Church, which meets in Green Lane Primary School and has trebled in size since it was started six years ago, offers a range of friendly Christmas events. Their aim is for every resident of Worcester Park to have a space and time to think, reflect, and find meaning to the ups and downs of Christmas and of life. Grace Church is one of those churches containing many who don't think of themselves as particularly 'churchy' or 'religious'- which means if you don't either, you'll feel at home!" About 40 children come along each Sunday and the church runs six different children's groups during each service to accommodate them. They also run relaxed evenings for people wishing to think through what they believe. So if you are looking for somewhere to express your faith in a less formal atmosphere, perhaps Grace Church is for you.